With Just Dance such a mainstay of the Ubisoft catalogue now, I guess it was inevitable that the Just brand would be taken to other places, and now we have Just Sing to look forward to. Related reading: Nick's take on last year's Just Dance, Just Dance 2016. Launching on September 8 on PlayStation 4 and Xbox One, in Just Sing you'll be either recording a performance to one of 40 tracks, or lip-syncing along to the music to indulge your inner rock star (even if you don't have the voice). 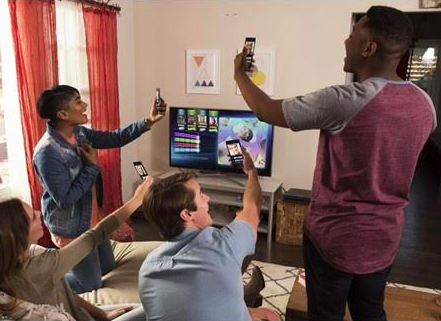 You'll get to play around with themes and filters, and then record your performances through the free Just Sing companion app for iOS or Android, or Xbox One Kinect or PlayStation 4 camera. Then you'll be able to share them easily with friends and the Just Sing community. It's notable that Ubisoft's wording of this game distinguishes it from a standard karaoke game. This one seems to be more about having fun with the performance of music, so one would expect that, like with Just Dance, you'll be encouraged to stand up and move about. Whether this has any value beyond being a narcissistic take on music games remains to be seen, but I really hope there is a more conventional karaoke game in there, because the track list is incredible, and while I have absolutely no interest in the online and social features of Just Sing, if it's possible to just kick back and sing, I'm in.